USB battery packs can ease a lot of the stress associated with a flagging smartphone battery, but they’re nothing but glorified paperweights if you don’t have the proper cable handy. Sure, you could try remembering to jam a standard-length cord in your back pocket and hope for the best, but there’s a much more civilized solution, and you always have it with you. I’m talking about your keychain, of course. There are several keychain-sized cables floating around the web, but I’ve had great experiences with two. 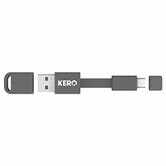 The one I’m using now is Kero’s Nomad Lightning Cable (there’s also a microUSB version, don’t worry). This 3" flat cable clicks into a sheath on your key ring, making it really easy to access for a quick charging session. It hasn’t once fallen out of the holder inadvertently in my experience, so you don’t need to worry about losing it, but the cable itself did come apart at the seams after about a year of living in my pocket. That said, it doesn’t seem to be any more or less durable than other Lightning cables, and I was happy enough to replace it. 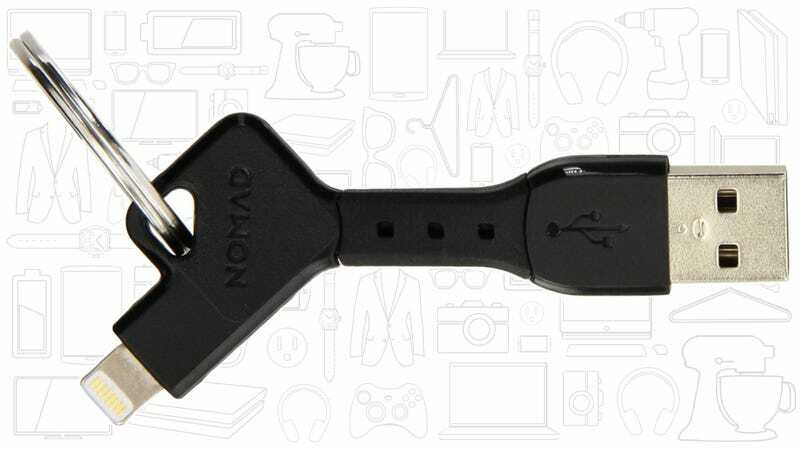 In case the Nomad Cable breaks on me again, I keep another option in my drawer as a spare: The similarly-named but unrelated NomadKey (Lightning | MicroUSB). From what I can tell, this little guy is built like a tank, and probably better suited than the Nomad Cable to the kind of abuse it’s meant to suffer, but a critical design flaw keeps it relegated to my bullpen. See, since it’s a single piece of hardware that attaches directly onto your key ring, you’ll either need to use it with the rest of your keychain dangling awkwardly in the middle, or get a blood blister under your fingernails from looping it on and off repeatedly. It’s not necessarily a deal killer, and as I said, the build quality here is top-notch, but it’s certainly worth considering.